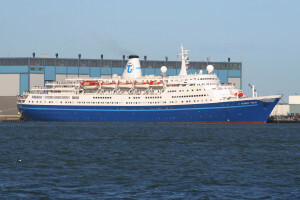 In 2010, Marco Polo was chartered to UK-based Cruise & Maritime Voyages for “adults only” cruises (ages 16 and above). In this role, she is one of a small handful of classic ocean liners still in active service. Marco Polo’s 2018-2019 sailing program shows regular departures from UK ports for cruises to the North Cape, Canada, the Baltic, the Mediterranean, Britain, the Arctic and various other destinations. She continues to operate as an “adults only” ship (advertised as “child-free” by owner and operator Cruise & Maritime Voyages.